The NY-NJ-CT region features hundreds of parks and landscapes, from the Catskills and Pinelands to the beaches of Jersey and Long Island. Despite all of this open space, these recreational spots are disjointed from each other and from the communities that would use them. 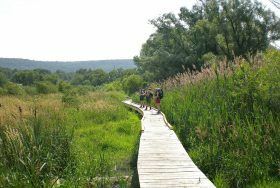 To better connect the parks to one another and to residents, the Regional Plan Association (RPA) has released a new proposal that calls for a Tri-State Trail network, linking 1,650 miles of biking, hiking, and walking trails in the greater New York region. The trail network would put over 8 million of the area’s residents within a half-mile of a trail, increasing access by 25 percent. It would put over 80 percent of today’s residents, or roughly 18.6 million, within just two miles of a trail.